When you need to change the password for your Wireless network, upgrade firmware or want to make some adjustment of your settings you will need to know the IP address of your router, without default router IP address you can not access router's configuration page. If you have changed IP address of your router and forgot it then, this article is very helpful for you. You can just use the command prompt to find IP configuration, use any of Wireless monitoring tools. Let's see all these methods one by one. 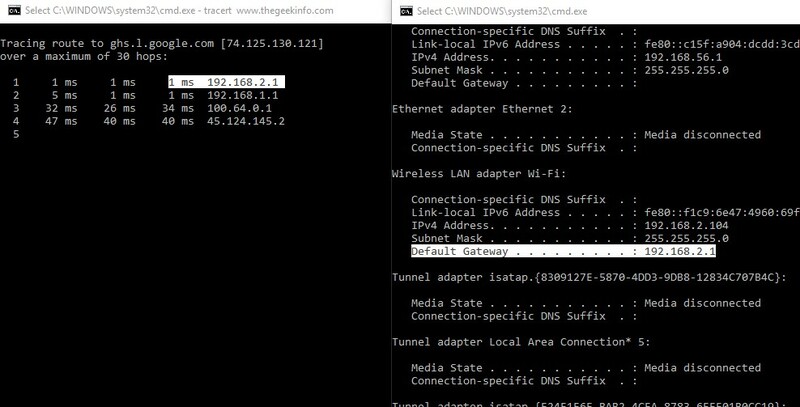 You can easily find router's IP address using any of these two commands on Windows. Now you can see your router's IP address in front of "Default Gateway". The first hop is your IP address of your router. Take a look at screenshots for help. The "Default Gateway" is your IP address for the router's setup page. If above methods don't work for you, then you can reset the router from a physical button on your router and find default IP address printed on the back of the router.